Also referred to as nature’s miracle plant, aloe vera has been the preferred choice for healing and softening the skin. Along with its wide variety of important uses, the plant is most known for its anti-fungal, anti-bacterial, anti-inflammatory, anti-viral and anti-septic properties. As a result, aloe vera gel has the unique ability to provide protection for epithelial tissue, which is the layer of cells that cover all body surfaces. These products may also stimulate fibroblasts to heal wounds and produce collagen. Since the products have many benefits, aloe vera gel has been one of the most popular skincare products for numerous years. Our comprehensive guide that features the best aloe vera products may encourage you to join the thousands of extremely happy customers. 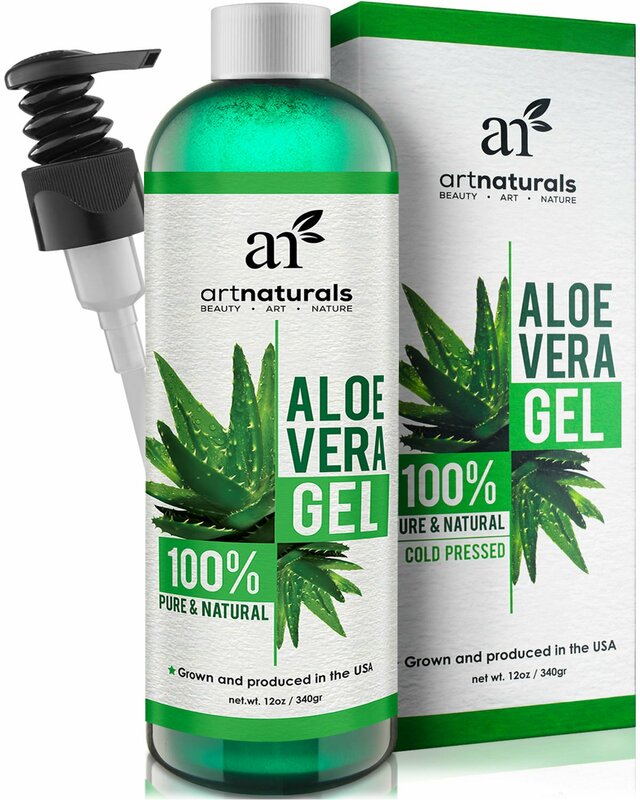 Recognized as an organic aloe vera healing gel, ArtNaturals Aloe Vera Gel is a multi-purpose product that can be used for a wide variety of topical ailments. Made from only premium organic and natural ingredients, the product can serve as a skin lotion, sun block, and shampoo/conditioner. The uniqueness of the aloe vera gel lies in its concentration of the barbandensis miller variety of aloe vera. The barbandensis miller aloe vera is most known for its medicinal healing properties. As a cruelty-free product, the aloe vera gel can even be used by anyone including vegans and children. The ArtNaturals Aloe Vera Gel is expertly formulated with an extensive array of 100 percent all-natural ingredients including potassium sorbate, citric acid, folic acid, vitamin B12, choline, ascorbic acid, aloe vera, xanthan gum, and free radicals. The aloe vera that is included in this gel is grown and harvested in Southern Texas. In addition, the plant is certified organic by the Texas Department of Agriculture. The aloe vera is cold-pressed for maximum benefits. The ingredients known as folic acid, vitamin B12, choline, and free radicals may work together to restore damaged skin cells, cleanse the skin, and prevent bacteria from forming on the skin’s surface. Xanthan gum serves as an emulsifier and a thickener. Ascorbic acid is a natural preservative and a good source of vitamin C. Manufactured synthetically, potassium sorbate is a safe food grade preservative. Another preservative in the product is citric acid. According to the company, the product contains a relatively small amount of natural preservatives. The ArtNaturals Aloe Vera Gel does not contain parabens or toxic chemicals. ArtNaturals is proud to present this aloe vera gel to relieve bug bites, sunburn, itchy skin, redness, and moisture-deprived skin. The product is also often used as an effective shampoo and conditioner to enhance the hair’s moisture, repair split ends, and restore the hair’s natural shine. The aloe Vera gel is perfect for sun-damaged or dry hair. The directions on the bottle state that product should be used as needed to heal skin problems. When targeted to strengthen your hair, the aloe vera gel can be used as a pre-shampoo treatment. Simply apply the aloe vera gel to your scalp at least thirty minutes before washing your hair. Most reviewers report that their hair is more manageable and healthier after using the product as a pre-conditioner. The ArtNaturals Aloe Vera Gel is intended for external use only. Many online reviewers have stated that the aloe vera gel has a liquid texture that is slightly thicker than water. Because the product contains natural preservatives, the aloe vera gel does not need to be refrigerated after each use. Sold in a 12-ounce bottle, the product’s packaging is made solely of recycled materials. The renowned company offers a 100 percent customer satisfaction guarantee. If you are not completely satisfied with the product, you’ll receive a full refund. When shopping for the product, just search for the most attractive aloe vera bottle on the shelf. Featuring vibrant green letters and aloe vera plant leaves on a white background, the ArtNaturals Aloe Vera Gel cannot be easily missed. 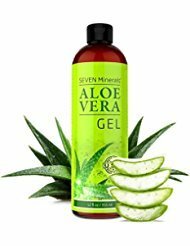 The Seven Minerals Aloe Vera Gel is unlike most aloe vera gels on the market. Made from seaweed extract, this 100 percent natural product provides your skin with a silky and soft texture. The product is praised for its clear color, nice consistency, neutral smell, and anti-bacterial and anti-septic propertied. Most customers agree that everyone should have this product in his/her medicine cabinet. Since the product is made of seaweed extract, the vitamins and minerals from the ingredient may hydrate, nourish, and condition your skin. Seaweed extract can also thicken the gel. The product is also rich in amino acids. Amino Acids can play an important role in improving your skin’s elasticity, texture, and tone. The product contains certified organic aloe vera that was grown in the United States. The company has also included potassium combated to prevent mold and citric acid to stabilize the gel’s pH. Ascorbic acid or vitamin C is also found in the product. The Seven Minerals Aloe Vera Gel is free from carrageenans. Most customers use the product to strengthen chapped, sun-exposed, and moisture-deprived skin. In addition, some people use the aloe vera gel to treat itchy scalp, dry skin, acne, dandruff, and scars. The aloe vera gel may also help your skin retain moisture. The directions on the bottle state that you should shake the product well before use. Afterwards, you can apply the aloe vera gel to most affected areas; however, the product should not be placed on your eyes. The aloe vera gel can be mixed with products such as facial cleansers, shampoos, massage oils, essential oils, and conditioners without any problem. Many users appreciate that the product absorbs quickly, and the gel does not leave a sticky residue. This aloe vera gel does not require refrigeration. Seven Minerals includes a money-back guarantee with every product. The company promises that you’ll notice results, or you’ll receive a complete refund. The product is sold in a light green bottle with dark green graphics and letters. Discover the healing power of aloe vera by trying the Amara Organics Aloe Vera Gel. Designed to soothe, hydrate, and repair skin, this beneficial product is made with 100 percent natural ingredients with no harsh addictives. You are sure to notice a difference in your skin’s overall appearance after regularly using the Amara Organics Aloe Vera Gel. The Amara Organics Aloe Vera Gel is formulated with 99.75 percent of pure and cold-pressed Aloe Vera that is from organic plants grown in the United States. Approximately.25 percent of the gel is made of natural preservatives. These natural preservatives are designed to maintain a safe product. Some of the listed ingredients include citric acid, ascorbic acid, organic aloe vera, potassium sorbate, and xanthan. This aloe vera gel is free from artificial colors, alcohol, and fragrance. As a result, The Amara Organics Aloe Vera Gel is recognized as the a premium aloe vera product. The uniqueness of this product lies in its versatility of uses. The aloe vera gel can be used to treat dandruff, razor burn, rashes, insect bites, sunburn, cracked cuticles, windburn, psoriasis, eczema, scalp itchiness, acne, and more. The product can also serve as a great hair gel, after shave, and post waxing treatment. Many customers also use the product as a conditioner to promote stronger and shinier hair. The Amara Organics Aloe Vera Gel can also heal a pet’s dry or irritated skin. Since the Amara Organics Aloe Vera Gel is not loaded with chemicals, the product can easily absorb into your skin to promote optimal healing. The consistency of the gel has been described as resembling thickened water. The company recommends applying a thin layer to the affected areas as needed. After regular use, your skin will feel silly and smooth without any sticky residue. Most customers appreciate that this product can last many months. The Amara Organics Aloe Vera Gel is sold with a comprehensive manufacturer’s guarantee; therefore, there is absolutely no risks when you purchase this product. If you are not completely satisfied with this aloe vera gel, simply contact the company to receive a full refund. Since the company’s top priority is to ensure that their customers are happy, you will not be asked to explain the reason of your dissatisfaction unless you would like to provide them with feedback and advice for improving future products. The 365-day money back guarantee also offers you the opportunity to keep the bottle. The Amara Organics Aloe Vera Gel is available in a white bottle with green graphics. The Fruit of the Earth Aloe Vera Gel is an extremely affordable moisturizing therapy for dry and irritated skin. By forming a protective barrier, the product can retain moisture and encourage optimal healing. Marketed as an all-natural and multi-purpose moisturizer, this aloe vera gel has been used to treat many problematic skin conditions. The product has been most known for its travel-friendliness, easy application, sturdy lid, and lightweight gel. The Fruit of the Earth Aloe Vera Gel will provide a cool and refreshing experience when your skin needs nourishing; therefore, there’s no better friend than this aloe vera product. The Fruit of the Earth Aloe Vera Gel is primarily formulated with concentrated aloe vera leaves. Additional ingredients in the gel include triethanolamine, tocopheryl acetate, carbomer 940, tetrasodium EDTA, DMDM hydrantoin, and diazolidinyl urea. Triethanolamine is an ingredient that serves as an humectant to retain or preserve moisture in your skin. According to the National Toxicology Program of the National Institute of Environmental Health Sciences, triethanolamine acts as a softening agent to enhance the skin’s surface. Also known as vitamin E, tocopheryl acetate may improve the overall health of your skin. The Environmental Working Group believes that tocopheryl acetate ultimately serves as a skin-conditioning agent and an antioxidant. The product’s thick, clear, and gel-like texture is due to concentrations of carbomer 940. The company has also included natural preservatives in the product such as DDM hydrantoin and diazolidinyl urea. While diazolidinyl ureacan can protect the skin against microorganism, DDM hydrantoin can extend the product’s shelf life. The product is free from fragrances, alcohol, and colors and, as a result, the gel will not stain. Because the product has multiple uses, many people continue to purchase the Fruit of the Earth Aloe Vera Gel. The aloe vera gel can be used to heal burns, moisturize oily skin, lighten tans, prevent pimples/blemishes, refreshen the skin, relieve itchy skin, and treat certain skin problems. The product can also be used as a primer, hair styling gel, and shaving gel. Weighing 1.7 pounds, this 24-ounce aloe vera gel is packaged in a clear bottle with a convenient flip cover that closes tightly. Many customers love that the gel does not collect at the nozzle. Since the gel has a thick consistency, you can control the amount of product that you need. The directions on the bottle state that you should apply the gel liberally to sunburned or irritated areas, but should not be placed near the eyes. The product is designed for external use only. After application, the gel will absorb quickly into the skin. The Fruit of the Earth Aloe Vera Gel is one of the most inexpensive aloe vera products on the market; therefore, the item is a great value if you’re interested in an affordable multi-purpose gel. The product can be located by searching for a clear bottle with a blue cap. When shopping for aloe vera gel, you should consider searching for products that contain only the inner fillet of aloe. The label should also state that the aloe vera gel is free of anthraquinone or aloin. Because alcohol is prone to dry your skin, good aloe vera gels should not contain this component. In addition, alcohol often contributes to a product’s short shelf life. The best aloe vera products are labeled 100 percent pure with minimal preservatives. Most importantly, the primary ingredient in these kinds of products should be aloe vera. The complementary components should only be natural additives. Along with ensuring that the products are formulated with pure ingredients, it’s also a good idea to verify that the aloe vera plant that is included in the gel is organically grown. Organically grown aloe vera does not contain any dangerous chemicals like pesticides. The organic farming methods also consist of carefully ensuring that each aloe vera plant is carefully nourished and developed to produce healthy leaves that contain solid active ingredients. Most purely organic aloe vera gels can be identified by searching for the organic certification label on the product. Pay close attention to the product’s recommended dosage. Reputable aloe vera gels will suggest that users apply about 30 millimeters to your skin three times a day. You can also simply apply the fresh gel as needed. Check with your healthcare provider to determine if the aloe vera gel is suitable for children. Although aloe vera is known for its many medicinal properties, you should ensure that the desired gel can be used for various topical ailments. The primary benefits of aloe vera gel includes accelerating the healing process, treating persistent skin problems and combating the signs of aging. Additionally, the product can be used as a shaving cream, hair gel, makeup remover, exfoliant, and moisturizer. There are many options for purchasing natural aloe vera gels. Some of the most common places that sell aloe vera products include vitamin shops, drug stores, mass merchandisers, beauty/skincare retailers, and organic markets. The local pharmacy at drug stores will likely offer aloe vera in the skincare or sun care aisle while mass merchandisers may stock pure aloe vera in the natural section of cosmetic aisles. The product may also be available in the health-foods aisle. Throughout the years, aloe vera has been an effective treatment for a variety of skin conditions including sunburn, frostbite, cold sores, psoriasis, abrasions, and burns. When shopping for the best aloe vera gel, you may want to consider buying a product that does not contain any added colors or fragrances. In addition, the most effective aloe vera gels will be formulated with minimal preservatives. Another important factor to consider is the consistency of the products. While some aloe vera gels may contain thickeners such as seaweed, xanthan, and carbomer, other products are made with minimal addictives to create an aloe vera gel in its purest form. By remembering the above considerations, you will be able to purchase the perfect aloe vera gel for your unique needs.